هدف اصلی از پژوهش حاضر، بررسی تأثیر رسانه‌های مختلف بر میزان تمایل افراد برای شرکت در انتخابات و همچنین گرایش سیاسی آنها (اصول‌گرایی‌/ اصلاح‌طلبی/ مستقل) بوده است. امری که اهمیت آن توسعه معرفت و دانش پژوهشگران را در زمینه تأثیرات سیاسی رسانه‌ها و بخصوص رسانه‌های جدید در پی دارد. جامعه آماری این پژوهش، دانشجویان کلیه دانشگاه‌های شهر اصفهان را در فروردین و اردیبهشت سال 1395 شامل می‌شود که 400 نفر از آنان به عنوان نمونه انتخاب شده و با پرسشنامه محقق‌ساخته به روش پیمایش مورد مطالعه قرار گرفته‌اند. نتایج پژوهش با استفاده از شیوه تحلیل رگرسیون لجستیک نشان می­دهد؛ در حالی که رادیو و تلویزیون باعث افزایش احتمال مشارکت افراد در انتخابات مجلس دهم شده‌اند، شبکه‌­های ماهواره­ای تأثیر منفی در این زمینه داشته‌اند و دو رسانه شبکه‌های ماهواره­‌ای و شبکه­‌های اجتماعی بر گرایش سیاسی افراد تأثیرگذار بوده‌اند به‌ طوری ‌که هر دو این رسانه­ ها باعث ترغیب افراد برای رأی دادن به گروه‌های سیاسی اصلاح ­طلب شده‌اند اما روزنامه‌ها و رادیو و تلویزیون تأثیری در گرایش سیاسی افراد نداشته‌اند. 1Assistant prof. in Political sciences, Isfahan Uni. The study aims to analysis the effect of different media on people's willingness to participate in elections and their political orientation (Fundamentalist, Reformist, and Independent). It is very important to develop Researchers knowledge in the field of political influence of media especially new media. The population of the research is students of all universities in April and May 2016. The sample includes 400 people that surveyed by using researcher-made questionnaire. Using logistic regression analysis the results showed that while radio and television increases the likelihood of participation in the parliamentary election, satellite channels have had a negative impact on it. Satellite channels and social networks have influenced people’s political orientations, So that both the media encourage people to vote for reform-minded political groups. But newspapers, radio and TV had no impact on political orientation of people. احمدی، فردین. (1393). تأثیر شبکه مجازی فیس‌بوک بر نوع مشارکت سیاسی دانشجویان دانشگاه خوارزمی تهران (با تأکید بر انتخابات دوره یازدهم ریاست جمهوری). پایان‌نامه کارشناسی ارشد دانشگاه تربیت معلم دانشکده ادبیات و علوم انسانی، تهران. باستانی، سوسن و زمان، لیلا. (1392). تأثیر استفاده از اینترنت و ماهواره بر رفتار اجتماعی جوانان: مقایسه کاربران و غیرکاربران در شهر اصفهان. 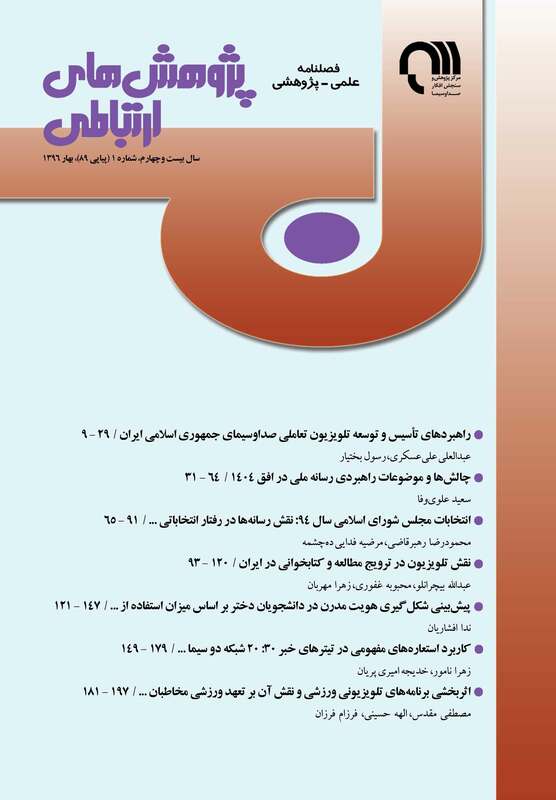 مجله جامعه‌شناسی ایران، صص 184-158. سیدامامی، کاووس. (1388). تلویزیون و انتخابات ریاست جمهوری در ایران. فصلنامه پژوهش‌های ارتباطی، 16 (1)، صص 91-63. عیوضی، محمدرحیم. (1388). تأثیر رسانه بر رفتار انتخاباتی. فصلنامه پژوهش‌های ارتباطی، 16 (1)، صص 157 ـ 138. مظفری، افسانه و مهاجری، محمد. (1389). بررسی نقش (تأثیر) تلویزیون در ایجاد (افزایش) مشارکت سیاسی مردم در انتخابات دهم ریاست جمهوری با بررسی مناظره‌ها. دو ماهنامه مطالعات رسانه‌ای، 1، صص 162-141. معصومی، مجید و محبان، محمدجواد. (1394). مطبوعات محلی و مشارکت سیاسی مردم در انتخابات یازدهمین دوره ریاست جمهوری؛ مطالعه موردی شهر کرمان. مجله دانش سیاسی، 20، صص 198-175. نیک‌ملکی، محمد؛ مجیدی، حسن و محمدخانی ملکوه، محمد. (1394). تأثیر شبکه‌های ماهواره‌ای بر فرهنگ سیاسی. فصلنامه مطالعات ملی، 2، صص 112-95. Best, S. J. & Krueger, B. S. (2005). Analyzing the Representativeness of Internet Political Participation. Political Behavior, Vol. 27, Pp. 183-216. Chan, J. M. & Lee, F. L. F. (2015). Media, Communication and Social Mobilization in Contemporary Hong Kong. In Rawnsley G., Rawnsley M. Y. (Eds. ), The Routledge Handbook of Chinese Media (Pp. 145–160). London, England: Routledge. Cohen, J. & Tsfati, Y. (2009). The Influence of Presumed Media Influence on Strategic Voting. Communication Research, Vol. 36, Pp. 359-378. Cox, G. W. (1997). Making Votes Count: Strategic Coordination in The World's Electoral Systems. Cambridge University Press. Effing, R.; Hillegersberg, J.V. & Huibers, T. (2011). Social Media and Political Participation: are Facebook, Twitter and Youtube Democratizing Our Political Systems?. Electronic Participation, Vol. 6847, Pp. 25-35. Eveland, W. P.; Morey, A. C. & Hutchens, M. J. (2011). Beyond Deliberation: New Directions For The Study of Informal Political Conversation From A Communication Perspective. Journal of Communication, Vol. 61, Pp. 1082-1103. Gentzkow, M. (2006). Television and Voter Turnout, Quarterly Journal of Economics, Vol. 121, Pp. 931–972. Goldman, Sh. (1966). Voting Behavior on the United States Courts of Appeals, 1961-1964. The American Political Science Review, Vol. 60, Pp. 374–383. Jennings, M. K. & Niemi, R. G. (1975). Continuity and Change in Political Orientations: A Longitudinal Study of Two Generations. The American Political Science Review, Vol. 69, Pp. 1316-1335. Kim, Y. & Chen, H. T. (2016). Social Media and online Political Participation: The Mediating Role of Exposure to Cross-Cutting and Like-Minded Perspectives. Telematics and Informatics, Vol. 33, Pp. 320-330. Kushin, M. & Yamamoto, M. (2010). Did Social Media Really Matter? College Students' Use of online Media and Political Decision Making in the 2008 Election. Mass Communication and Society, Vol. 13, Pp. 608-630. Kyle, H. A.; Lu, Y. & Lee, J. K. (2016). Filtering out The other Side? Cross-cutting and like-Minded Discussions on Social Networking Sites. New Media & Society, 1461444816634677. Margolis, M. & Resnick, D. (2000). Politics as Usual: The Cyberspace Revolution. London, GB: Sage. McCombs, M. & Shaw, D. (1974). A Progress Report on Agenda-Setting Research, Paper Presented To The Association For Education In Journalism, San Diego, CA. Metzgar, E. & Maruggi, A. (2009). Social Media and the 2008 US Presidential Election. Journal of New Communications Research, Vol. 4, Pp. 141-165. Nie, N. H.; Hillygus, D. S. & Erbring, L. (2002). Internet use, Interpersonal Relations and Sociability: A Time Diary Study. In B. Wellman and C. Haythornthwaite (Eds. ), Internet and Everyday Life (Pp. 215- 243). Oxford: Blackwell. Price, V. & Zaller, J. (1993). Who Gets The News? Alternative Measures of News Reception and Their Implication for Research. Public Opinion Quarterly, Vol. 57, Pp. 133-164. Schlozman, K.; Verba, S. & Brady, H. (1995). Voice And Equality: Civic Voluntarism in American Politics. Cambridge, MA: Harvard University Press. Zhang, W.; Johnson, T.; Seltzer, T. L. & Bichard, S. (2010). The Revolution Will Be Networked: The Influence of Social Networking Sites on Political Attitudes and Behavior. Social Science Computer Review, Vol. 28, Pp. 75-92. Zuniga, G. D. H.; Molyneux, L. & Zheng, P. (2014). Social Media, Political Expression, and Political Participation: Panel Analysis of Lagged and Concurrent Relationships. Journal of Communication, Vol. 64, Pp. 612–634.